This article was originally published on Documentary.org (Documentary magazine) by the International Documentary Association. 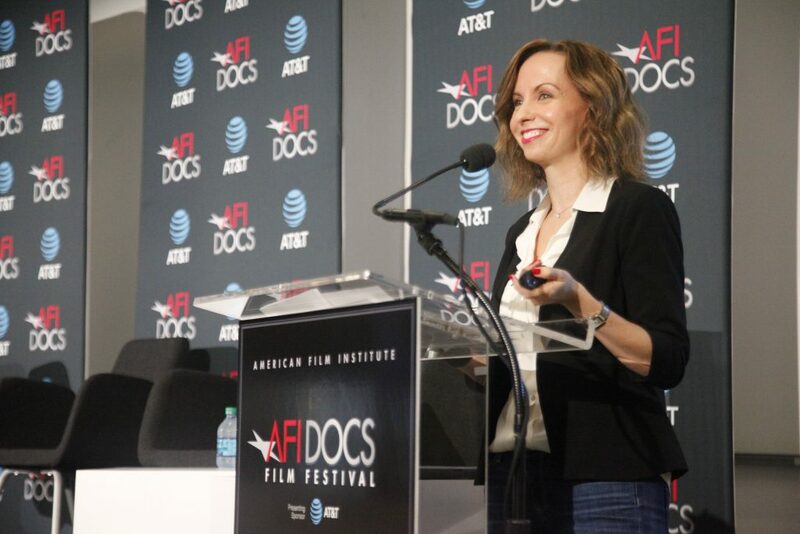 The annual AFI DOCS Filmmaker Forum, presented in association with IDA and Women Make Movies, was held this year from June 23-26 at the AFI DOCS Festival Hub in downtown Washington, DC. Diversity and inclusion were the central themes of the first two days, which was sponsored by the Center for Public Broadcasting (CPB). The forum started with the panel “Beyond the Black/White Divide,” featuring Ramona Diaz (The Learning, Don’t Stop Believin’), Carlos Sandoval (The State of Arizona) and Danielle Jackson, co-founder of the Bronx Documentary Center. The panel was moderated by Angie Chuang, associate professor at American University, and was a continuation of the #OscarsSoWhite conversations that emerged following Chris Rock’s controversial Oscars monologue earlier this year. The panel also built on the question that journalist Jose Antonio Vargas raised inMedium.com when he wrote that “when the media does talk about race…it’s always white vs. something. But what about the conversations people of color have across and within their communities?” The panelists said this topic is particularly pertinent as the United States moves toward a “majority minority” population, and at various times the panelists called the topic “fragile,” “private” and “dirty laundry,” but agreed that documentary and public media are the best places to have these conversations. The panel was followed by the keynote, W. Sean Kelly, the Global Lab Leader at Deloitte and co-author of the paper “What if the Road to Inclusion is Actually an Intersection?“. He described the concept of “intersectionality,” an idea that was introduced in the 1980s by Kimberlé Crenshaw to address the “multiple avenues” by which discrimination can occur. The term is also used broadly to describe the multiple social identities everyone possesses. Friday opened with the presentation “What #OscarsSoWhite Can Tell us about the Film Festival Circuit.” Caty Borum Chattoo, co-director of the Center for Media and Social Impact (CMSI), presented findings from two recent CMSI studies, “The Journey to the Academy Awards: An Investigation of Oscar-Shortlisted and Nominated Documentaries (2014-2016)” and “Diversity in Independent TV Documentaries: Is Public TV Different?”The two studies examined the perception that documentary offers more opportunities and recognition than fiction for women and directors of color, an idea that has been circulating in trade publications. Next, MacArthur put funders in the “hot seat” about diversity efforts, chatting individually with Bonni Cohen, co-founder of Catapult Film Fund; Amy Halpin, director of filmmaker services at IDA; Jeff Hardwick, senior program officer for the National Endowment for the Humanities; and Eliza Licht, VP of content strategy and engagement for POV. The next two days of the forum focused on the growing opportunities in short films and virtual reality. Saturday’s first panel, “Big Ideas, Small Packages: Short Format Documentary,” presented in conjunction with Harber’s Studio, was moderated by Jon Gann, the founder of the DC Shorts. He was joined by panelists Megan Mylan (Taller than the Trees, Smile Pinki); Dan Krauss (Extremis, The Kill Team); Kahane Cooperman (Joe’s Violin, The New Yorker Presents); and Kathleen Lingo, executive producer of The New York Times Op-Docs. Mylan described the short form as “freeing,” both in terms of “the range of stories you can tell” and because there “isn’t the same need for longitudinal [storytelling] or character transformation.” The filmmakers on the panel agreed that working in shorts was also a practical decision that allowed them to make films on smaller budgets and shorter time frames. Lingo added that filmmakers are thinking “shorts first” because there are so many more outlets and opportunities. “Shorts just make sense with the moment that we’re in,” she concluded. Moderated by Pat Aufderheide, founder of CMSI, the panel featured Brad Lichtenstein (Across the Line); Mitch Gelman, senior fellow at the Newseum; Emma Mankey Hidem, founder and CEO at SunnysideVR; Amy Nichols, co-founder and CEO of bThere Inc.; and Gina Scarpulla, supervising producer at Discovery Communications. And because the medium is so new, experimentation and research are key. Lichtenstein and his team used theater techniques to develop Across the Line, which was co-produced with Planned Parenthood. The resulting story was told in three scenes with distinctive styles: a re-creation scene, an observational/vérité scene and a games-style animated scene.